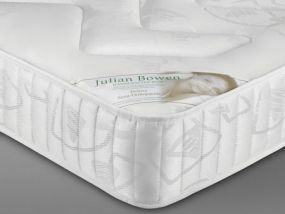 If you're looking for a comfortable mattress to give a great night's sleep, then the Julian Bowen King Size range is a great choice. The Premier King Size Mattress offers year-round comfort and a stitch quilted cover that makes sleeping on it truly relaxing. The Deluxe Semi Orthopaedic King Size Mattress contains a strong coil system and a firmer feel for people who need that feature when sleeping. We offer all Julian Bowen mattresses at a great low price with next day delivery available, so ordering with us means you get the best deal there is. 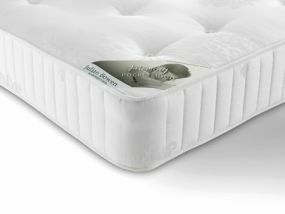 Made in the UK, these mattresses are best sellers thanks to their supreme comfort and quality, so whatever you require from a mattress - either firm for support, or softer to awaken well-rested - BedzRus has a suitable choice. 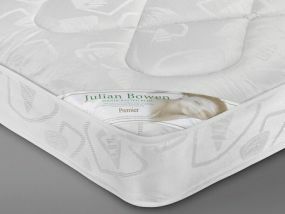 As a premium yet affordable brand, Julian Bowen mattresses ensure you get the best night's sleep possible.